Just a few more variations and I am finishing this buttonhole stitch sampler for TAST challenge. 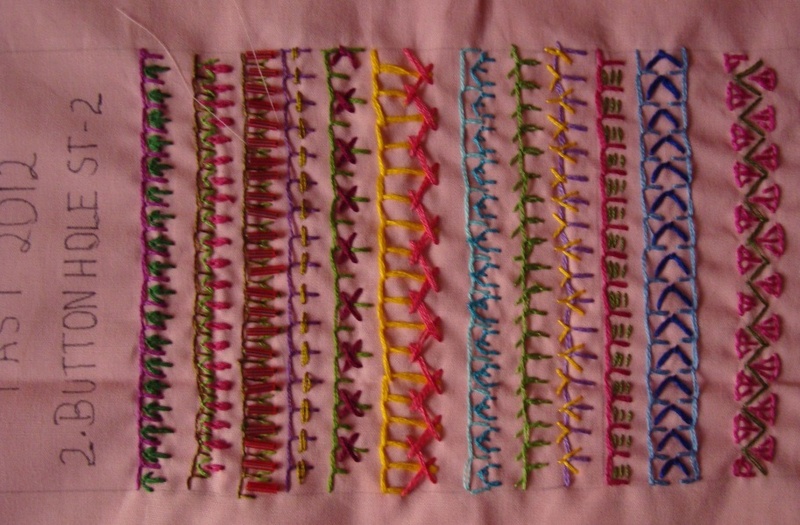 Two rows of buttonhole stitches facing each other, connected with cross stitches and chain stitches. A variation of buttonhole stitch, whipped with rimjim thread. A row of buttonhole stitch, a row of closed and open herringbone stitch, ending with buttonhole stitch variation. Slanted buttonhole stitch done in v-shape with straight stitches. I tried working butterfly chain stitches with the buttonhole stitches, embellished with beads. At last it happened , I finally ran out of ideas for this stitch. LOL! I had drawn my ideas on a paper , before stitching, still some variations were a surprise, some were fine, and some were even disappointing. Over all I enjoyed working on this sampler, which by itself was learning process . 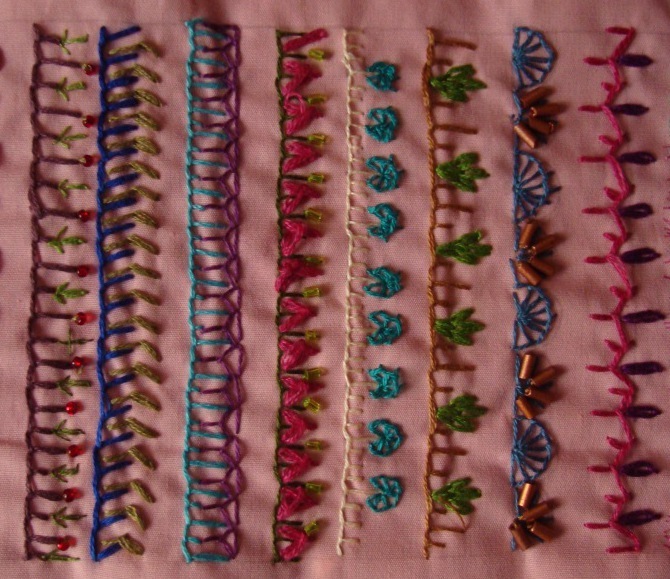 A few more variations of the buttonhole stitch from TAST challenge by Sharon. A buttonhole stitch variation with fly stitch and detached chain stitch. Slated buttonhole stitch variation with detached chain stitch with long tail. This buttonhole stitch variation with feather stitch variation. On this buttonhole stitch variation, two chain stitches are worked together in v-shape . Buttonhole stitch worked[ badly!] in semi -circle over a line of buttonhole stitch variation. Three detached chain stitches worked in a row of buttonhole variation. On a same size half circle, buttonhole stitches are worked in two different ways. With bugle beads[ bad choice of colour]. Buttonhole stitch worked in zigzag pattern with detached chain stitch. The rimjim thread is whipped around a row of buttonhole stitches. I tried some more variations of buttonhole stitch with other stitches. Button hole with fly stitches, before attaching the beads. 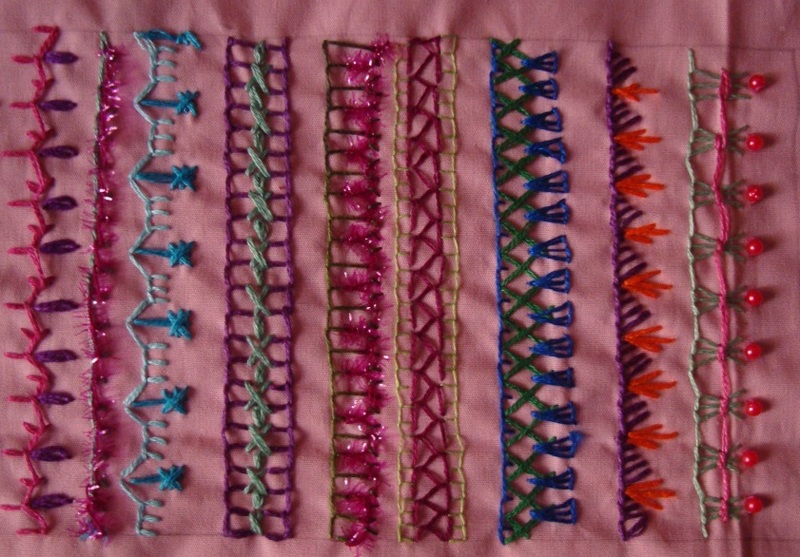 A row of buttonhole stitches ,with detached chain stitches. A variation of buttonhole stitch with cross stitches. This row of buttonhole stitches are tagged with herringbone stitch. Button hole stitch with set of three buttonhole stitches. looks clumsy though! I tried working buttonhole stitch by alternating twisted chain and normal chain, I was surprised by the effect! While working this sampler, a thought came about working on some motifs with this stitch. I did not work any motifs during the earlier stitch challenge. 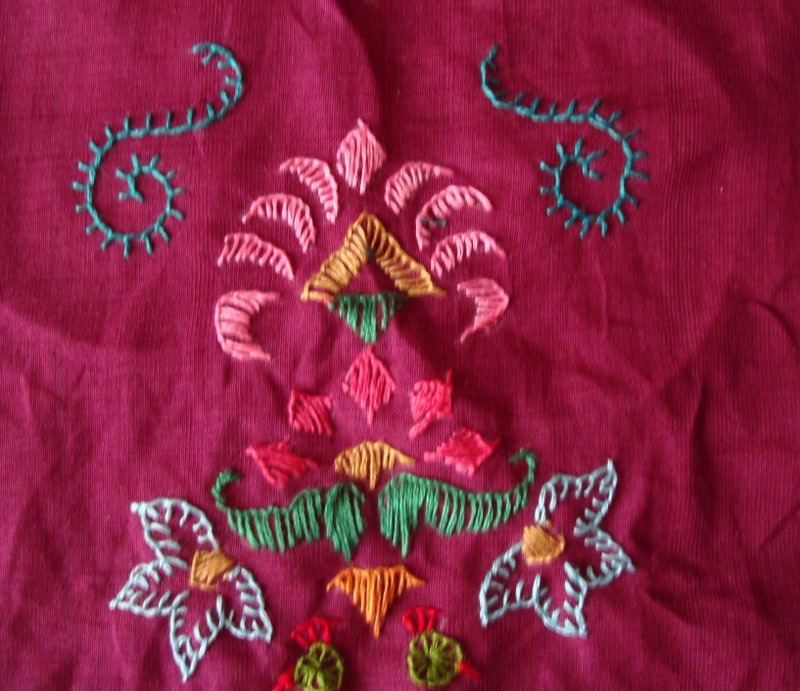 And there is a particular ethnic Indian embroidery, which uses this stitch for working the motifs, other stitches like, back st, herringbone, chain,fly, mirrors, kutch work are also incorporated into this ethnic embroidery. This being a buttonhole stitch sampler, I intended to work on buttonhole stitch exclusively for this motif sampler. the central design is ethnic pattern , I added a few motif patterns, which I couldn’t work as a band sampler. As mentioned earlier, all shapes are worked in buttonhole stitches only. The scalloped pattern is an addition. 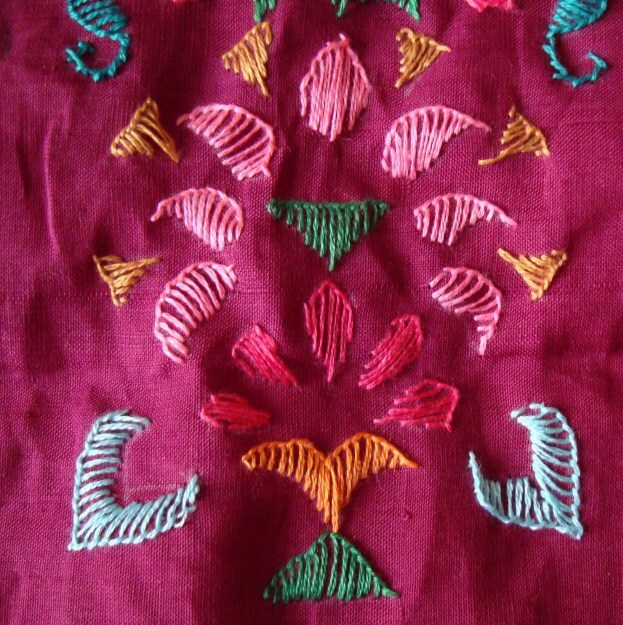 The parrot is integral part of this ethnic embroidery, with eyes it would have looked better, LOL! The shape done in light blue is an addition. 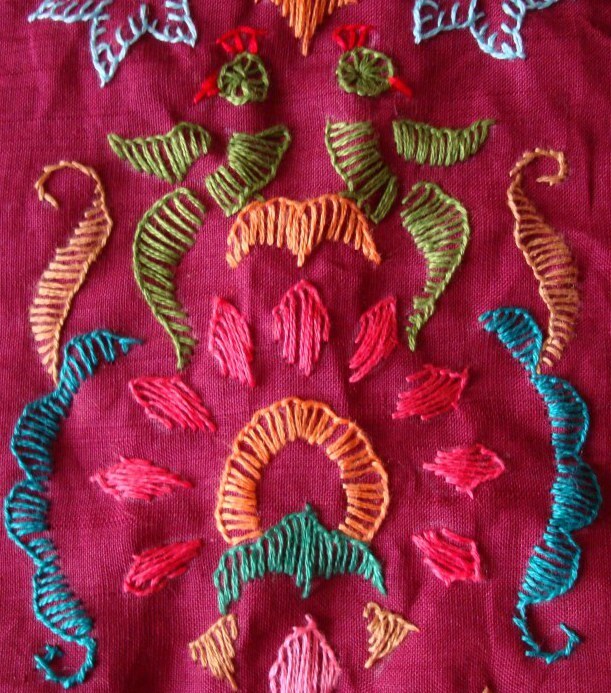 This being just a buttonhole motif sampler, I did not add mirrors or beads. I have to continue my band sampler. Yesterday being Tuesday, Sharon on her blog announced stitch of this week- buttonhole stitch, of the TAST 2012 stitch challenge. I did a stitch sampler of this stitch during the previous TAST challenge. It was posted here. I worked the earlier sampler in even weave fabric, so I thought, maybe I’ll try some more variations of this stitch with other stitches and beads on plain fabric. So many people are part of this challenge, they are all working in their unique style. Some people are doing stitch sampler, some are doing motifs, some are using different fabrics, some are doing ATC, it’s a totally different world out there. Other than being part of this challenge, I have a personal challenge of working on a sampler of decorative seams with the stitches from this challenge . so with this idea, though I have already explored this stitch before, it seems a good idea to explore this stitch some more. With the raging fly stitch fever-The button hole stitch is worked along with individual fly stitches. Will have to try some more.